When I was at secondary school, back in the 1970’s, we were always seated in alphabetical order, A to Z, front of classroom to back. Being a “W”, I was always at the back of the class, seated between Adrian Wareham and Ian Wilkinson. There were no concessions to kids with poor vision in those days and I think the system was designed for the convenience of teachers when taking the register. In our second year, we were stationed about a mile from the main school building in what was referred to as “The Annex”. In fact, this building was an old Victorian school; brick-built with an enclosed playground. The Annex was a bit of a backwater, slightly more relaxed than the main school since the head and deputy-head rarely visited. My English teacher and form tutor that year was Mr. Thompson. I remember his classes fondly, particularly the readings we did from John Buchan’s novel, Prester John; an ideal adventure for 13 year old boys whose understanding of the world didn’t extend further than their own small town in the Northwest of England. English classes took place mainly in the afternoons and, in summer, it just so happened that the combination of my desk position, the configuration of the Victorian sash windows and the sun at that time of year, meant that, uniquely among our class, I was bathed in sunlight at the start of the class. Mr. Thompson would often enter the room, notice the illuminated Watson and declare, “the sun shines on the righteous”. At the time, I took this as a compliment but thought it rather strange that a teacher should show favouritism so openly. It was only later in life, much later actually, that I became aware of the true meaning and realised that it was not favouritism at all, but most likely a little joke which, I guess, he knew few of us would understand. The phrase, of course, is a partial miss-quote from the Bible (Matthew 5:44-45). The full quote from the New International Version is: “He causes his sun to rise on the evil and the good, and sends rain on the righteous and the unrighteous.” Effectively, it means, everyone is the same, both the good and the bad and we should love our enemies. Fine words indeed and I guess I’ll never know whether Mr. Thompson was just having a little joke at my expense or whether it was just a throw-away line he was using out of context. It doesn’t really matter to me which, it remains one of my abiding memories of school life. Which is why it came to mind this week as I strolled along towards my latest climb in the Lake District fells on a gloriously sunny day. Righteous or not, the sun really was shining and the sky was clear blue. Looking across Crummock Water to Grasmoor during the climb to Mellbreak north top. I was spending a few extra days in the Lakes after a really lovely family get-together I’d organised at Ulpha. My brother, my sister and their partners had joined me, Hannah and Mum for a weekend to celebrate Mum’s 80th birthday. It offered a rare opportunity for us all to spend some time together and we decided it was also the perfect time to scatter Dad’s ashes. He died almost 10 years ago and although we hadn’t got round to doing anything with the ashes, now seemed the right time to take them somewhere he would have loved. So, on a sunny Saturday morning, we found a lovely spot on open fell with a fantastic view and remembered Dad. He loved the great outdoors and I doubt I would be so keen had it not been for his influence. After everyone had departed on Monday morning, I drove Mum back to Southport and then returned to the Lakes on Tuesday morning with a mission to make a start on the Western Fells. That last, big, fat zero had been bugging me and I wanted to have bagged at least some fells from all seven of Wainwright’s guides. The weather had been unusually fine (for the Lake District) all through the weekend and was now continuing into the following week. I arrived at Maggie’s Bridge car park, between the village of Loweswater and the lake of the same name, just after 10 and set off towards the intimidating northern slopes of Mellbreak. The intimidating form of Mellbreak from the track at Lowpark. 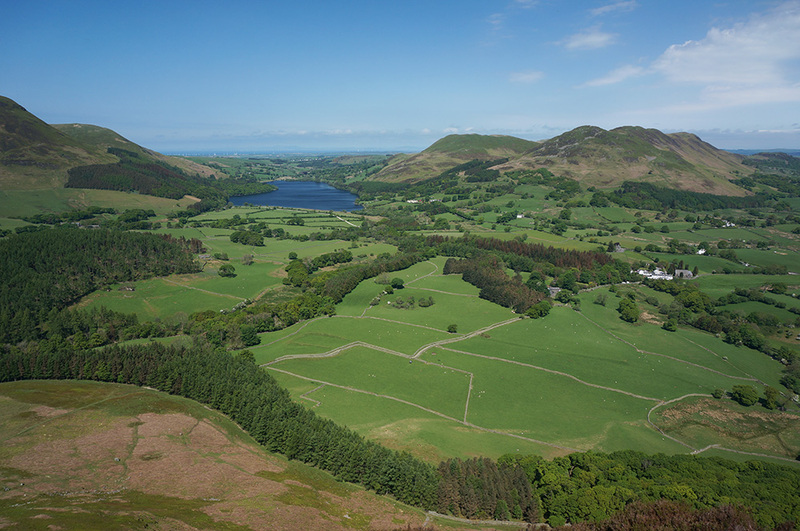 The Loweswater fells are a well-defined group. They are geographically proximate but that’s about all they have in common; they are a group of individuals, not linked by ridges or direct footpaths and that means a lot of ups and downs. Despite the relatively low tops (Blake Fell being the highest at just 573m), this walk demanded a total height gain of 1191m. Whiteside, Grasmoor and Whiteless Pike from the track at Lowpark. Mellbreak is the most stand-offish of the group and the only way to include it in a round of fells is to go all the way up one end and all the way down the other. 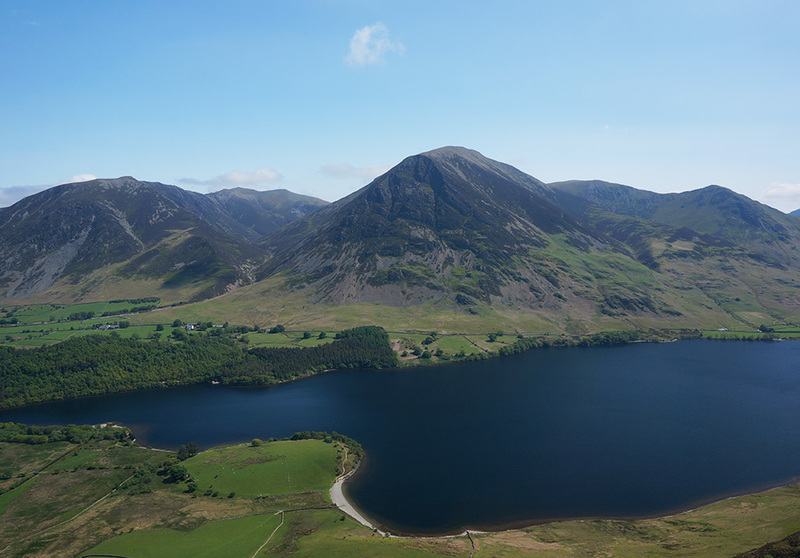 Fortunately, its dramatic location, beside Crummock Water, means that views from the top of this fell are well worth the effort. As Wainwright says, “There is only one Mellbreak”. Loweswater and farmland from the climb to Mellbreak north top. It’s a steep but enjoyable climb to the north top once the worst of the scree has been negotiated and the views from the top are fantastic, especially those to the east, across Crummock Water to the Grasmoor massif. The north top is slightly lower than the true summit at the south top but the views from the north are better. I spent some time taking in those views before continuing south to the summit. 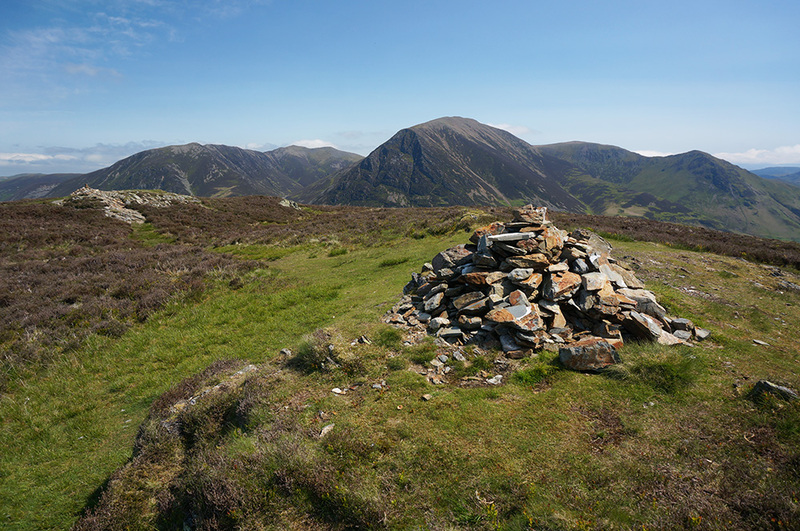 The cairn at the north top of Mellbreak, looking east to the Grasmoor massif. The descent to Mosedale is mainly grassy and uneventful, as is the short trek west along the base of Gale Fell. 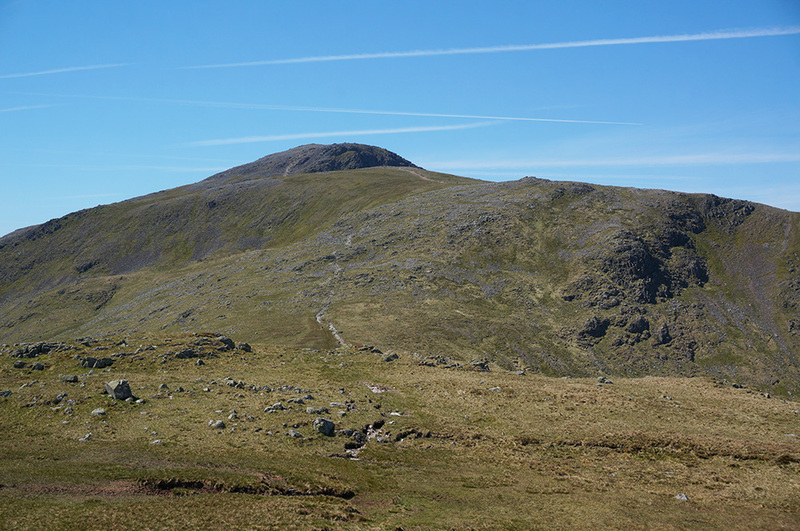 Eventually, the bridleway arrives at the start of the steep climb to Hen Comb, a simple, grassy dome. 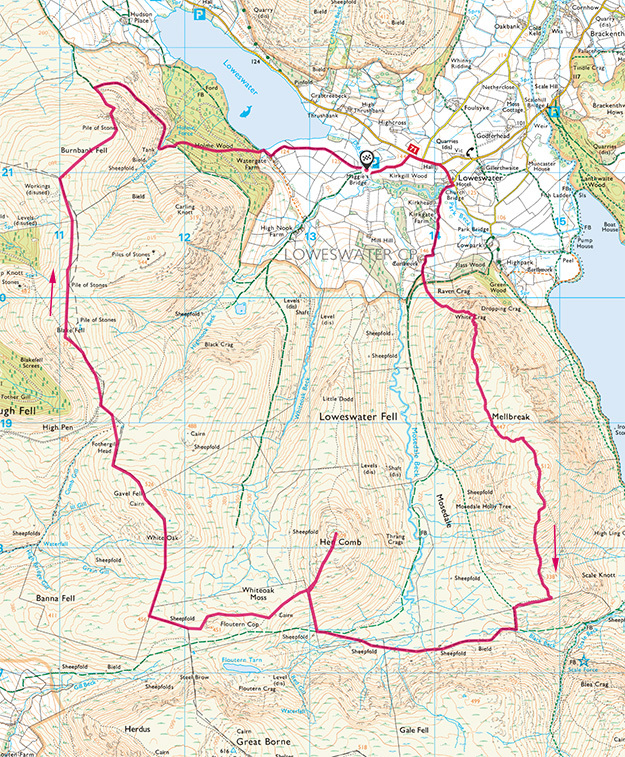 The Loweswater Fells (17.5km and 1191m of ascent). Start/end: Maggie’s Bridge car park. Rocky climbs are far more interesting than steep, grassy banks but these are in short supply on the Loweswater Fells and the climb to Hen Comb summit, despite the fine weather, was a rather dull trudge with little in the way of consolation at the top. A small cairn and restricted views are the only prize. As Wainwright says: “It is the sort of fell sometimes climbed, but rarely twice”. 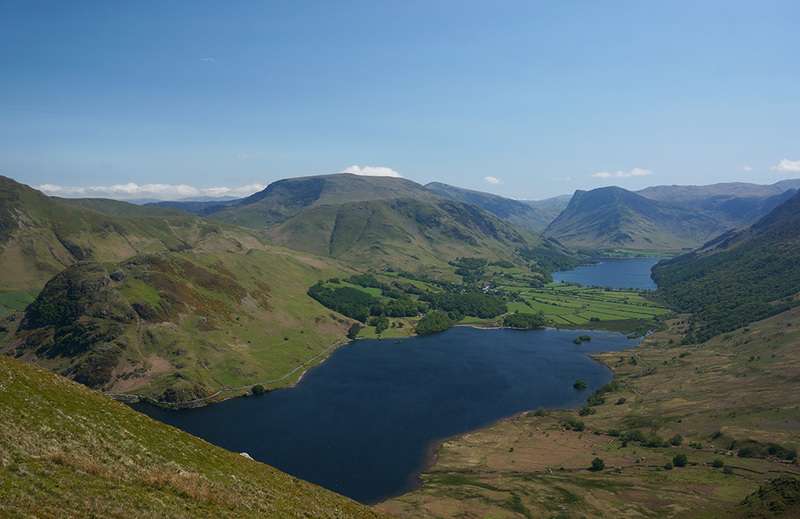 Crummock Water, Buttermere and Fleetwith Pike from the south top of Mellbreak. From the summit of Hen Comb, the only way to proceed on this rather awkward-feeling route is to backtrack most of the way down the hard-won slope before striking off towards Floutern Cop, followed by another climb towards Gavel Fell. At this point, I began to hear, in my mind’s ear, John Lydon opining “this is not a ridge route” to the tune of (this is not a) Love Song, a pretty good expression of how I was feeling. The day began to feel unexpectedly arduous. 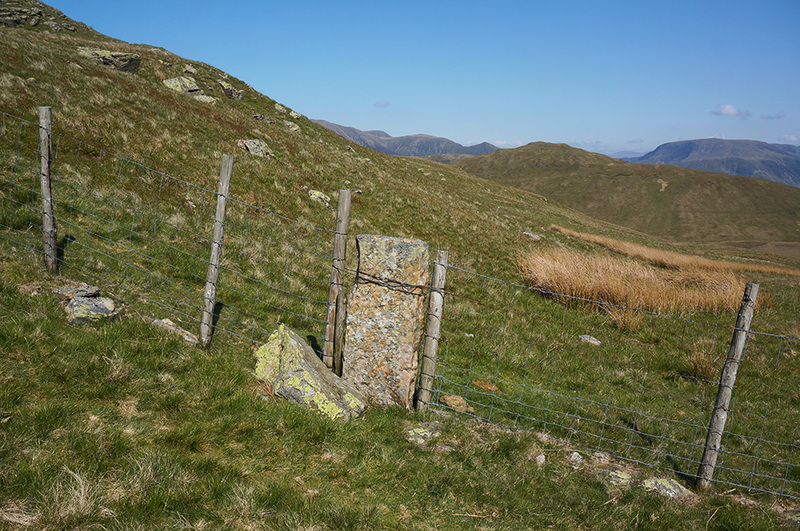 A detail of the fence, rising to the summit of Gavel Fell. The approach to Gavel Fell summit is via another steep grassy slope but at least there is a half-descent cairn to mark the top and open views to the west, over the coastal plain and to the Irish Sea. Next, another drop and another climb, this time to the highest point on the walk at the summit of Blake Fell. Here, at least, there is a proper cairn in the form of a wind shelter and some good views. I lingered for a while, customary at the highest point of any walk, and took in the view. A perfectly positioned seat looking over Loweswater and across Crummock Water to Grasmoor. The final top of the day was Burnbank Fell, another Wainwright eccentricity. 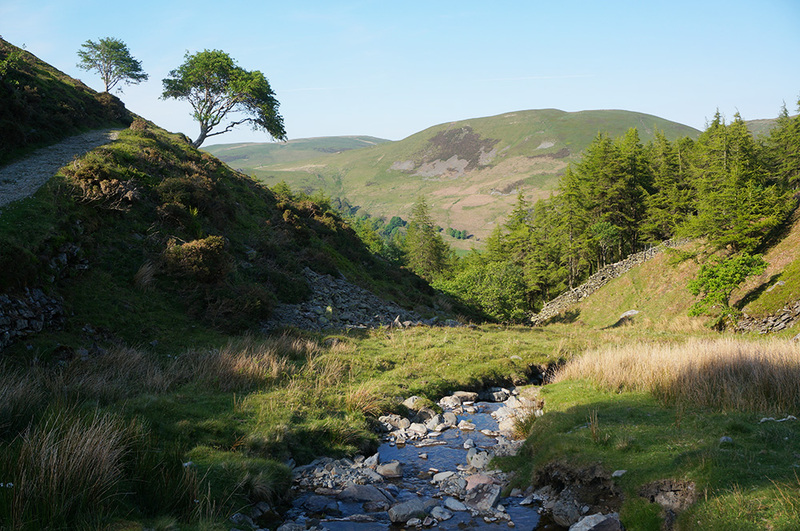 Whereas the nearby Carling Knott has all the physical characteristics of a fine fell, it is not awarded separate fell status, whereas Burnbank Fell (no more than a northern shoulder of Blake Fell) is. Mark Richard’s comment is apposite: “…in one influential list this was deemed a separate fell, and you may wonder why”. Still, a list is a list and I was walking through this one, so I headed north, a gentle downhill stroll. The summit of Burnbank Fell is no more than the junction of two fences in a flattish grassland. A point is marked by a small collection of stones. The returning track curves into Holme Beck. The return to the car park via Loweswater lake is very pleasant indeed, particularly once the bridleway is gained, and I was grateful for it. 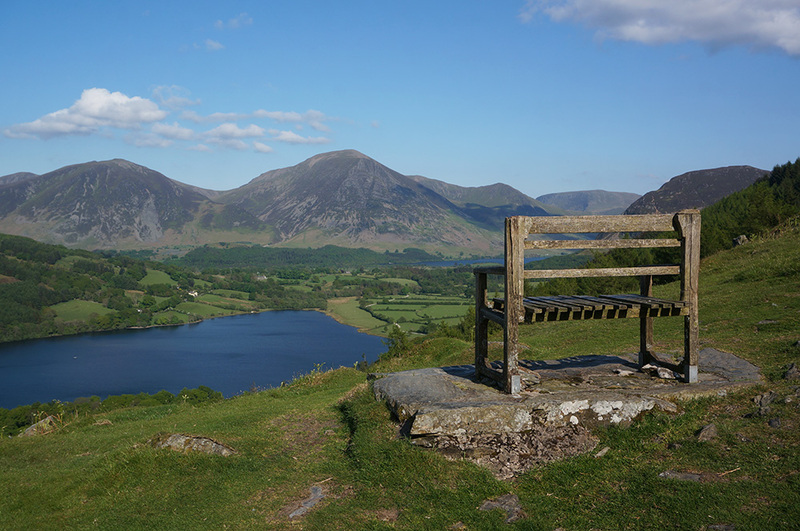 At one point there is even a wooden seat located so as to take in the view over Loweswater and Crummock Water to Grasmoor. There’s a lovely diversion into Holme Beck and then a steep drop through cooling woodland shade. 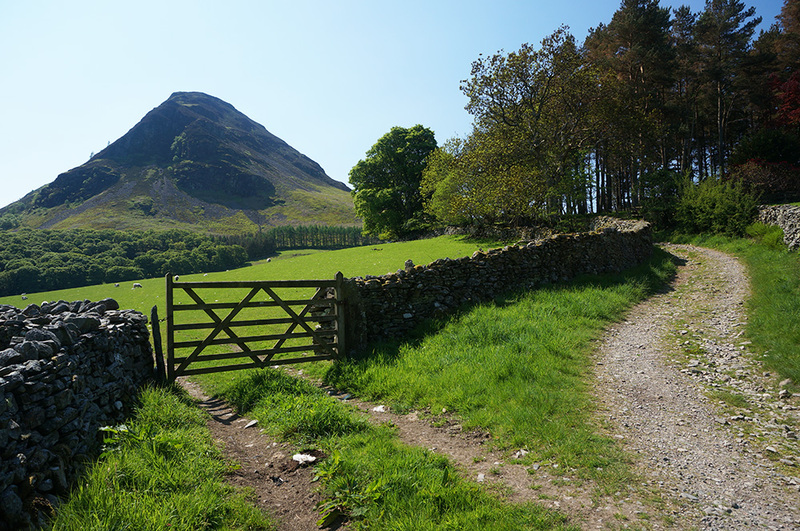 Eventually, the path emerges at the shore of Loweswater where a well-made track winds easily through pasture and back to Maggie’s Bridge car park. All-in-all a really comfortable end to the day. If anything, the weather on Wednesday was even better than the day before. Some of the haze from the previous day had burned off and the air was even clearer. I drove to the National Trust car park at Seatoller and got there early enough to choose a space in shade. I pulled my boots on and set off down the road to Seathwaite, joining the footpath at Seathwaite Bridge. 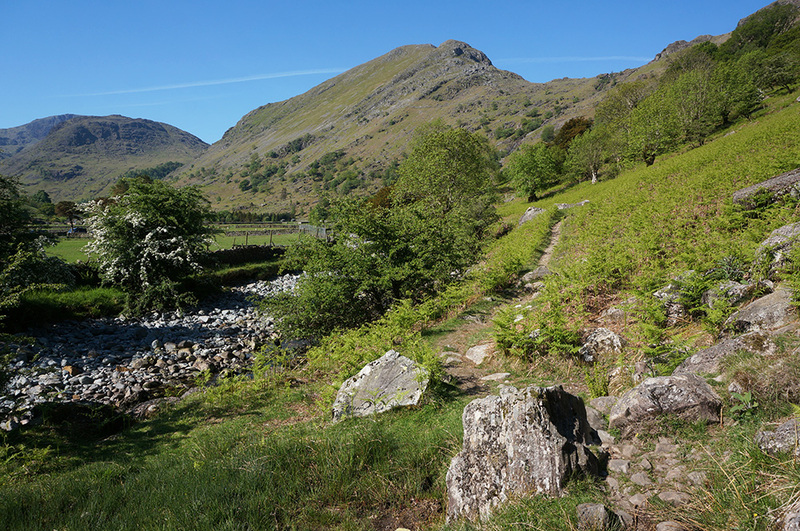 The riverside footpath to Seathwaite with Base Brown in the centre. Everywhere seemed quiet but I noticed that the road to Seathwaite was already lined with parked cars. This is a popular start point for walks and an early-morning arrival is obviously essential if you want to park close to Seathwaite itself. 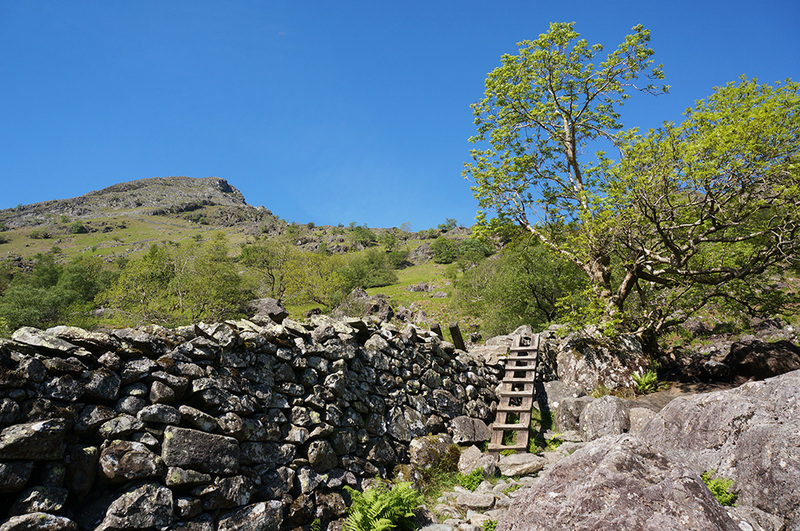 An unusual ladder stile, crossing a stone wall on the pitched path above Seathwaite. After a footbridge over Sourmilk Gill, the path takes a sharp right and climbs steeply. Fortunately, the path is excellently pitched and although it is steep, the going is quite easy. The direct route to the summit of Base Brown leaves the pitched path near the top of the ridge and strikes off over open fell. There is no obvious path for most of the way but it is an exciting route and I felt the day was starting well. There is a fantastic section of path, no more than a sheep trod really, that passes directly below the well-known “hanging stone”. This feature even gets a mention on the 1:25,000 Ordnance Survey map. It’s actually quite a modest boulder in size but its situation is remarkable. 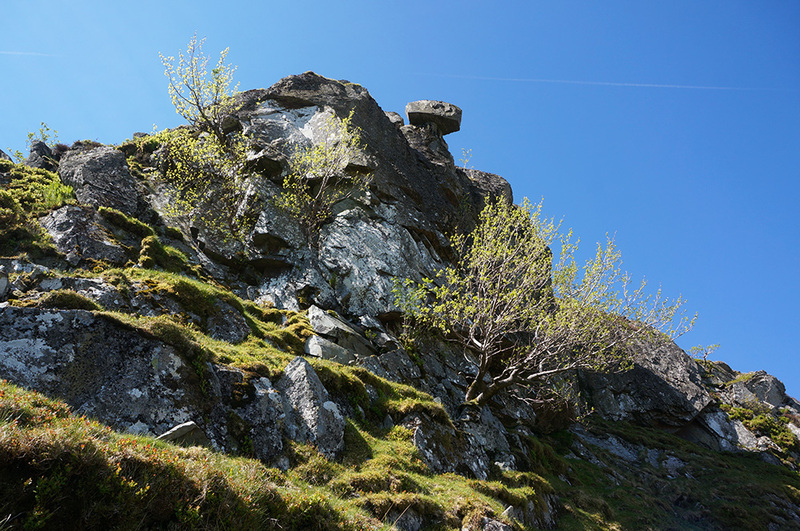 The famous Hanging Stone above a crag on Base Brown. When I reached the summit, there was a group already there, taking an early lunch, so I had my own mid-morning break and waited for them to depart so I could have the place to myself. When lunch was over, my fellow fell walkers strapped on their rucksacks. One of them lit up a cigarette and another began vaping as they departed. I’d never seen this on the fells before and it looked completely incongruous, but that’s probably just my own prejudice coming to the surface. 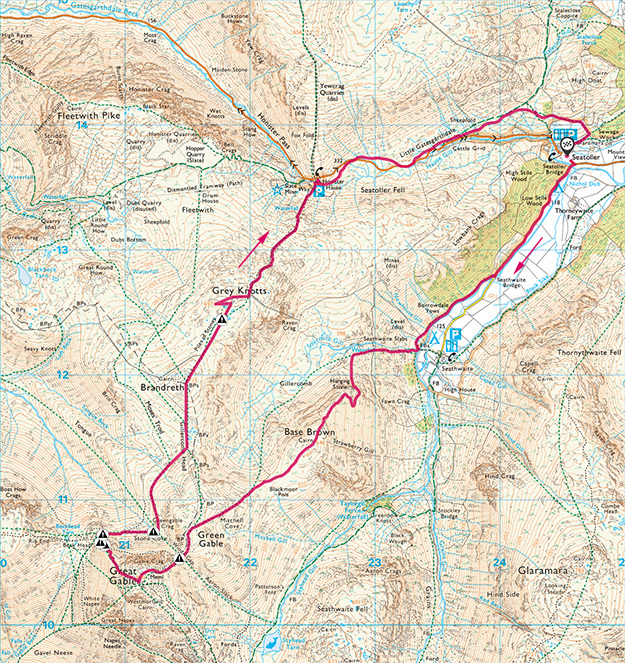 A Great Gable Round (12.6km and 1273m of ascent). Start/end: Seatoller car park. The cairn at Base Brown is a generous, bouldery affair and the views aren’t bad either, especially east to the Borrowdale Fells. This walk was in complete contrast to that of the day before. Whereas the Loweswater fells are predominantly grassy mounds, today’s fells are rocky and craggy with boulder-strewn summits. I have to admit, I prefer the latter. 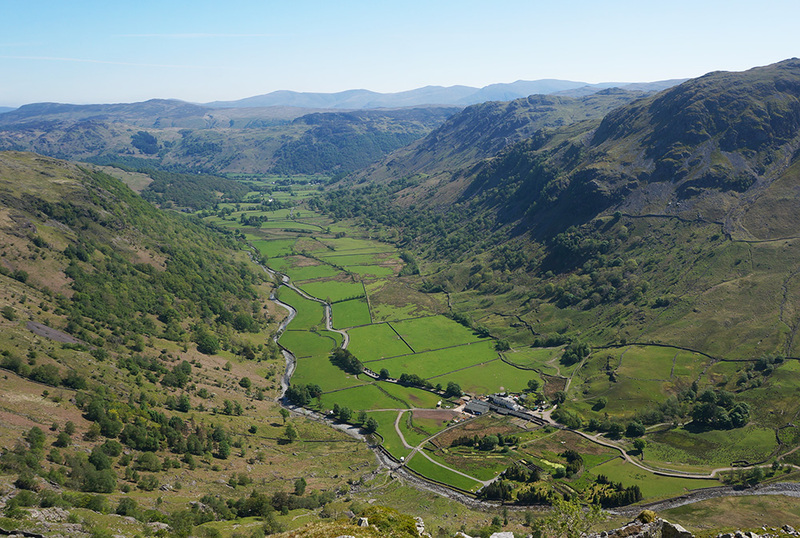 The view down to Seathwaite from Hanging Stone crag on Base Brown. I headed south-west along the clear ridge path to Green Gable. There’s a significant climb but the rise is steady and I reached Green Gable summit just 40 minutes later. What a view! 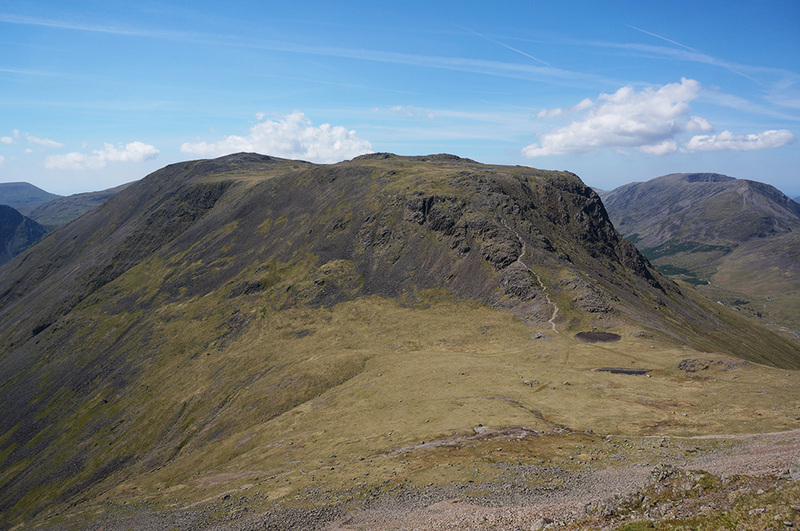 People rave about the view from Great Gable, but for me, Green Gable has it beat. The eye is drawn to Ennerdale and the fells either side, Pillar on the left and High Crag on the right, and then to the Buttermere valley and the North Western Fells beyond. 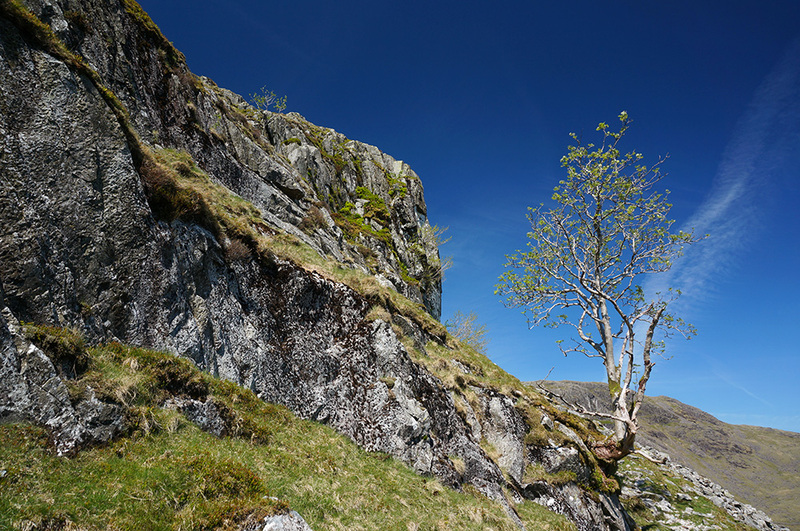 A tree at Hanging Stone crag on Base Brown. I spent some time at Green Gable summit just taking everything in and was fortunate to have the entire time to myself other than the passing of one or two folks en route to or from Great Gable. After I couldn’t drink in any more of the scene, I headed down into Windy Gap to begin the steep scramble to Great Gable summit. The clear ridge path from Base Brown to Green Gable. Windy Gap is a busy cross-roads and the confluence of a number of routes to the popular Great Gable. I passed a number of (mainly elderly) walkers and walking groups, all of whom remarked on the beautiful weather we were having. The amazing view from Green Gable summit to the north-west along Ennerdale. Great Gable summit is a barren, rocky place, tricky to negotiate but wonderfully airy, being the highest point in the immediate vicinity. The 360 degree views are impressive but somehow not as beautiful as those from Green Gable (I may be in a minority here). 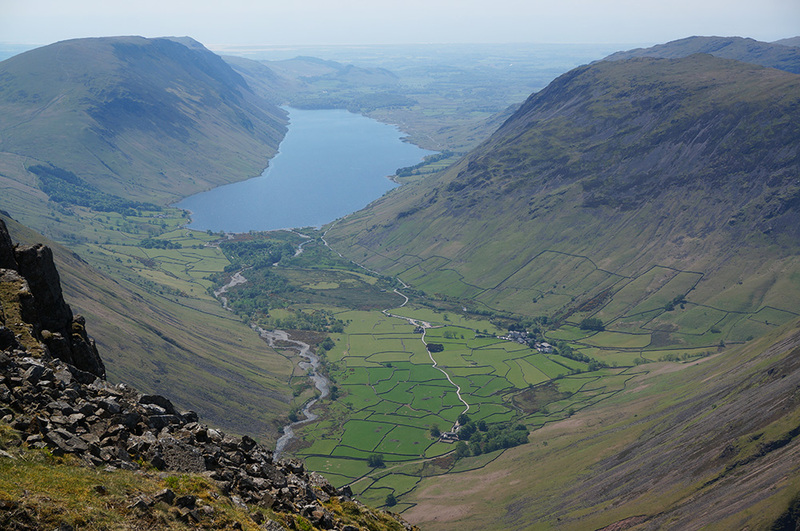 For the first time, there are views down into Wasdale and it is a great place to develop a good understanding of the local geography. The war memorial at Great Gable summit. I sat and had my lunch at the highest point of the day at 899m and one of the more interesting summits among the 214. 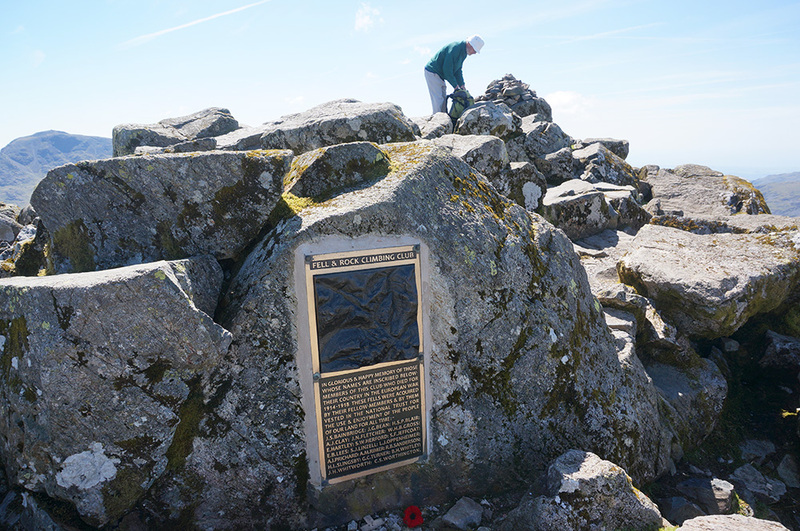 A small summit cairn is set atop a rough rock outcrop on the north-east of which is set a war memorial “in glorious and happy memory” of those members of the Fell and Rock Climbing club who lost their lives in the 1914-18 war. 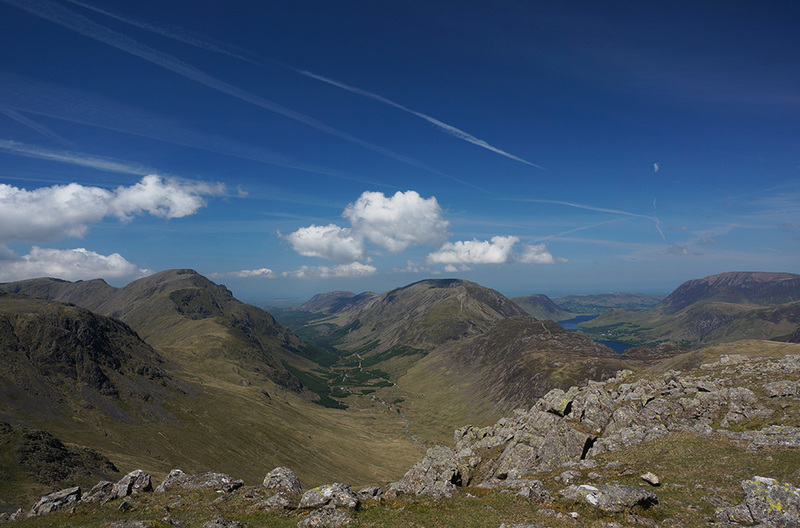 Wasdale from Great Gable summit. One of the difficulties with rocky summits is that there are no obvious paths leading off the top. 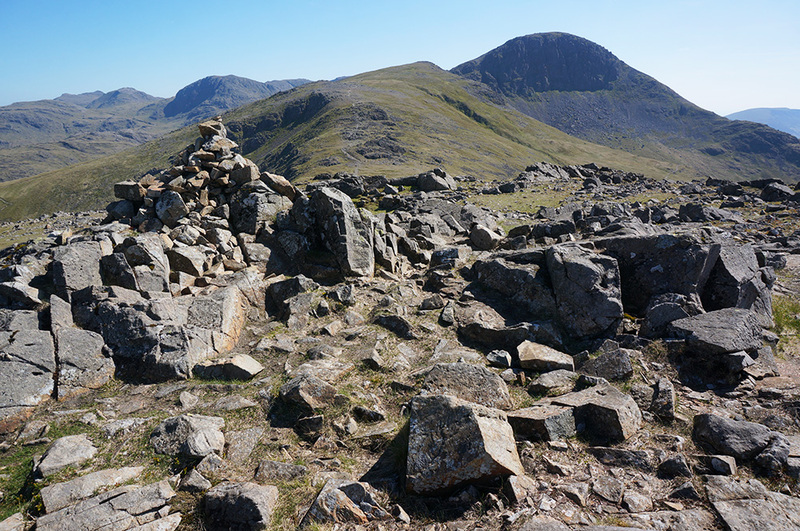 At Great Gable there are lines of cairns to show the way but even then it’s not always clear. Well, that’s my excuse. Looking at the map, I determined the direction I needed and headed off following an intermittent and indistinct path, bound for the north-west ridge. The going was very rough with lots of rocky scrambling and some scree to negotiate and at some point I must have strayed from the line I was supposed to be taking. Looking across Beck Head to Kirk Fell from Great Gable. At the bottom of a particularly difficult rock chimney, I found myself a the top of a steep scree slope with what looked like eroded paths, leading down. I’d traversed similar terrain on other fells so I wasn’t too worried until I realised that these weren’t compacted paths, they were loose scree and impossible to descend without slipping. That’s when I got worried because I then realised that it would be too dangerous to retrace my steps. The only option I had was to go forward over the loose scree. I’ve heard of people freezing in these situations because every available option seems too dangerous. I tried to stay calm and work out how best to move down the scree without causing a major rockslide. After a few experiments, I worked out that coming down, crab-like on my bottom and zig-zagging to reduce the incline was the best method. It was painfully slow but after what seemed like an age but was actually only half an hour, I reached the safety of the path below me. I sat for a while on a large boulder and tried to work out what had gone wrong. I was furious with myself for not having been more careful and for having put myself in such a dangerous position. I was very lucky to have escaped with nothing more than scuffed boots when it could easily have resulted in a serious head injury. Another lesson learned. After I’d regained my composure, I headed up the path to the point at the base of the north-west ridge where I should have been had I taken the correct route. In my own mind, this extra climb was only fair punishment for my lack of concentration. Having regained my planned route, I set off across Stone Cove, below Gable Crag, heading for Brandreth. The afternoon was clear, still and warm and I was thankful for a clear path and a solid, grassy fellside to walk upon. The actual (not the accepted) summit at Brandreth, looking south to GreenGable and Great Gable. Brandreth summit is a curious place. It feels and looks like an abandoned builder’s yard and the accepted summit is obviously not the highest point. All a bit confusing but for good measure, I visited both summits and went on my way. The route to Grey Knotts is easy, there’s a fence to follow and by now I was beginning to relax again after my ordeal. 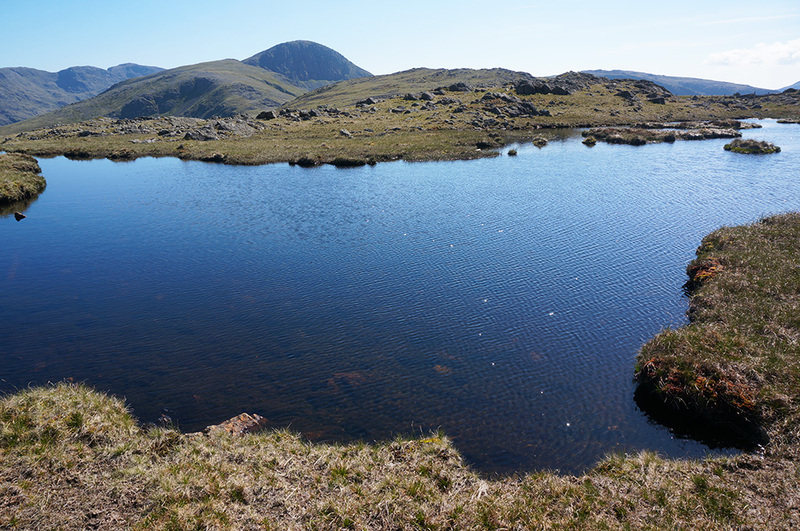 I made it to the summit via some lovely small tarns with clear water, sparkling in the afternoon sunshine. One of the lovely tarns at Grey Knotts, looking south to Green Gable and Great Gable. 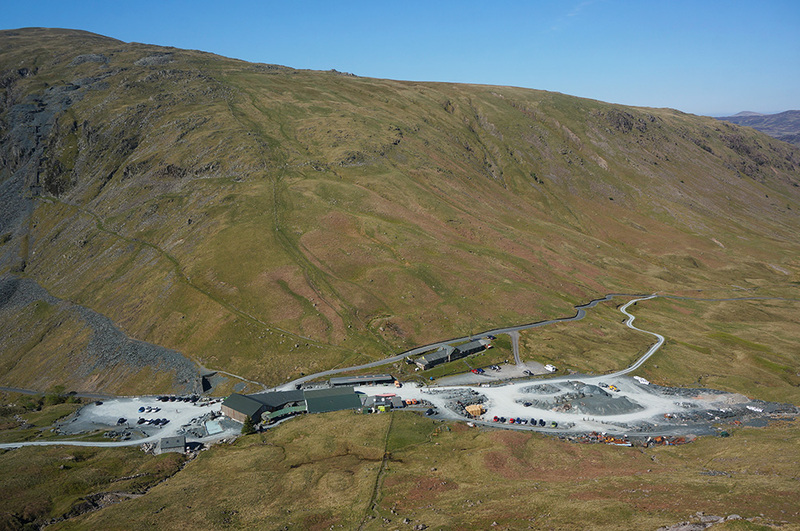 The final leg of the route follows a fence down the steep fellside to Honister Slate Mine. There’s never any doubt about the route but it is steep and there are a few scrambles on the way. I arrived at the visitor centre having finished that last of my water but still thirsty, so I pulled out my emergency five pound note and got myself a welcome cold drink. Honister Slate Mine and Youth Hostel from the top of the steep drop from Grey Knotts. After a brief look around the site, I set off down the Honister Pass road and then coming off onto the very pleasant bridleway that led back to the Seatoller car park. I had a short walk planned for Thursday because I had to drive home that afternoon. I was aiming to mop up a few outliers before leaving the Lakes. Unfortunately, despite it being another beautiful day, things didn’t go to plan. Having packed up and checked out of Ambleside Youth Hostel, I was just driving into Rydal when the car lost power. I managed to crawl into a lay-by but there was obviously a problem I couldn’t fix. I phoned the breakdown and waited about an hour. Apparently, the engine management system thought there was a fault with the throttle position sensor and decided to immobilise the car. So that’s another 10 Wainwrights to add to the total, which now stands at 168. That takes me past the three-quarter mark, leaving just 46 more to complete the 214. I’ll be back in the Lakes in July to bag a few more but I’m not in a hurry to finish the challenge and aim for completion sometime in 2019.